Governor Rick Perry says that he would support using a portion of the sales tax from car sales on roads, highways and other transportation infrastructure. During the State of the State address in January, Gov. Perry proposed using $3.7 billion from the Rainy Day Fund to pay for water and transportation projects around the state. The governor has maintained that the Rainy Day Fund should be used for infrastructure costs, though did not provide a dollar amount at the conference Friday. Following Perry’s announcement, House Transportation Chairman Larry Phillips (R-Sherman) spoke in the “Politics of Financing Our Transportation Needs” panel at the conference. 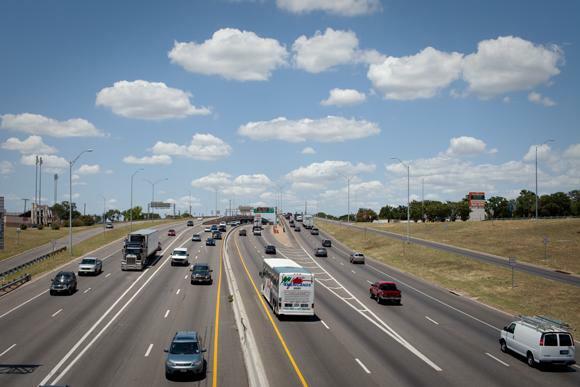 Phillips filed a bill that would dedicate a portion of vehicle sales tax to Texas Department of Transportation (TxDOT). He said that agency's official reports, which say that the state needs $4 billion to maintain current infrastructure, could be too low. “We say we have a $4 billion shortfall for transportation, I believe it’s closer to $7 or $9 billion,” Rep. Phillips said. State Rep. Drew Darby (R-San Angelo), who also participated in the panel, has filed transportation bills that would increase motor vehicle and trailer registration fees to fund TxDOT. The bill would increase the fee by $30, from $50.75 to $80.75. “There’s no such thing as a free lunch or a free road,” Rep. Darby said, adding that two thirds of the addition revenue from fees would be used for non-toll roads. The other third, he said, would be used to pay down existing debts. The bills to increase registration fees and to dedicate car sales tax to transportation infrastructure are still pending in committee. The last time the Texas Legislature approved construction expenses for public universities and community colleges was in 2006. This session, lawmakers are considering a tuition revenue bond bill that would approve billions for new buildings. University administrators told lawmakers they need millions of dollars for construction projects on their space-strapped campuses. They cited skyrocketing student enrollment numbers, aging buildings and new research projects as reasons to lay the bricks and mortar. A plan approved today by the Texas Senate Finance Committee would spend a lot of money on water and road projects if Texas voters give the go-ahead. A constitutional amendment proposed by committee chair Tommy Williams, R-The Woodlands, would tap into the Rainy Day Fund, which is money mostly from the state’s gas and oil tax revenues, for transportation and water projects.